Techsmith SnagIt 8.1 Screen Capture - our trusted software companion. As a technical writer, I generally illustrate my articles with screen captures of websites, desktop screen and even software. SnagIt 8.1 is the versatile brain behind every picture and screenshot that you see here on Digital Inspiration. I use Techsmith SnagIt 8 to capture a screen area and then enhance the capture with Annotations, Titles, Borders, Arrows, Watermarks in SnagIt Editor. SnagIt Video Capture Mode lets you create screencasts (screen recording) with Audio. 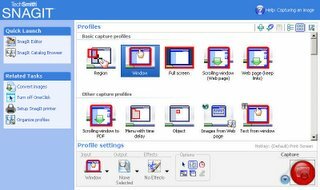 SnagIt is not just for taking screen captures, you can edit any image in Snagit Studio - crop or rotate images, apply filters, add annotations, borders, text titles. SnagIt also comes with Batch Image convertor - much useful than the Xara Photo Editor. Just specify a Web site URL and SnagIt will download all to capture all GIF, JPG, and PNG images available on that website. SnagIt can convert any webpage and files to PDF. To convert a long Microsoft Word Document to PDF, capture it in SnagIt AutoScroll mode and save it as PDF from SnagIt editor. You can also Stamp a document just like in Acrobat. Download logos from websites which are otherwise impossible to copy. Some webmasters splice web graphics to prevent downloading of images. With SnagIt, you simply draw a border around the various images and capture them as one single graphic. Web Designers can capture draft site layouts, add titles, captions and quickly share the designs with clients in PDF or any image format. Experienced SnagIt users can even create complete web design personas in SnagIt studio. Adobe won't let you save images from protected PDF documents. And it requires even greater effort to save pictures embedded in Windows Help Manuals (CHM, HLP) - SnagIt can help you do this in just a click. Whenever you win a bid on Ebay, buy something online or make a bank transaction - take a web capture with SnagIt and save it in PDF. Can be used as a proof in case of any dispute. 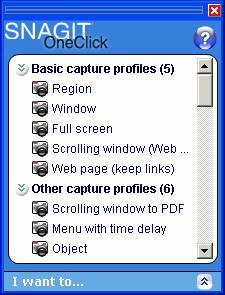 All the screenshots in this article were taken with SnagIt 8.0 and enhanced in SnagIt Editor.